The art of poetic inspiration derived from the potential of extra virgin olive oil as a vehicle for sensations and emotions. Ingredients and meals are our messengers. Like archangels and postmen they convey our feelings, identities and desires to our friends, loved ones or clients. Through our cooking we introduce ourselves, share stories and experiences, and embark on new journeys and adventures. 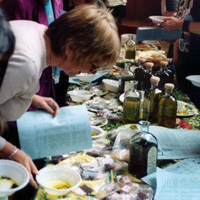 Extra virgin olive oil is a unique ingredient and condiment in that it is capable of transmitting harmoniously that which we place in it and thus has the potential to be particularly eloquent and expressive in itself. Writing with flavoured and scented extra virgin olive oil allows us to express our emotions, intentions and states. All that's required is to choose the extra virgin olive oil most appropriate for our purpose and personalise it, imbuing it with those aromas, flavours and colours that reflect our inspiration. The oil is our ink, our letters are written first on food to satisfy the receiver's appetite and then on their senses. Participants were invited to compose their own letters, starting with the ink, expressing themselves through their own personal combination of the many herbs, spices, aromas and flavours on offer. Their vocabulary was unlimited. They also had at their disposal an index of all the ingredients with their provenance and suggested symbolic, lexical, and emotional charges. They were encouraged to take time to carefully sample the aromas and build their narrative, then to send their letter to its recipients and, if lucky, maybe they got a reply! As with her Sensory Concerts participants were presented with a range of stimuli and invited to unleash their creative instinct. On this occasion they not only became performers but composers too, scripting sensorial experiences for others. Through the metaphor of writing letters and by encouraging the participants to consider the associations with which various aromas and flavours may be invested, Alicia highlights the narrative possibilities of food. Oxford Symposium of Food and Cookery, St Anthony's College, Oxford, September 2005. Say Aah, City Council of Brighton and Hove, Brighton, September 2005. As part of various olive oil courses around Spain.